Our club is fortunate to welcome Bruce Wadleigh as a member. Bruce refers to himself as a “recovering banker” – a title he has grown into over that past 15 years as the founder and owner of Barnwood Naturals. More on that in a moment. Bruce grew up in the Clackamas County community of Beavercreek and graduated from Oregon City High School. And from there he began a higher education odyssey that spanned eight years and resulted in – no degree. 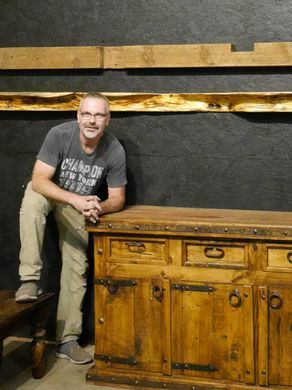 So in 2003 with accumulated savings and no knowledge of his new chosen endeavor (he says he had never really used a hammer) he started his business Barnwood Naturals. He began dismantling old structures and re–purposing the lumber into functional works of art. Several of our members, including yours truly, have utilized Bruce’s talents with stunning results. He truly is an artist. His business employs five people and has grown to serve customers all over the United States. Bruce says the part of his business he likes the most is working at night when it is quiet and he can be creative. Bruce is proud of his two children, Jake who attends Oregon State and Jenae who is a senior at UC Davis. In leisure time Bruce enjoys cycling, architecture, snowboarding and, like a number of our members, Palm Springs in the winter. He loves living in Salem where he resides downtown and commutes to work on his legs. In responding to why he is joining Rotary, Bruce comments that his research showed that Rotary is a very focused and effective organization, both locally and globally. Bruce really appreciates the Rotary led improvements made at the Riverfront Park and future plans for Gerry Frank | Salem Rotary Amphitheater. The Rotary Club of Salem will certainly benefit from having Bruce Wadleigh as a member. Next StoryRotary Literacy Small Grants Window | Now Open!